On the fourth day of Christmas Domestic Sluttery gave to me... some vintage Christmas decorations for my tree! The chaps at Pedlars are doing their best to get us in the Christmas mood with their Christmas baubles (yes, those are chocolate coins you spot in that photo, it's not Christmas until you've pillaged the tree of chocolate coins). 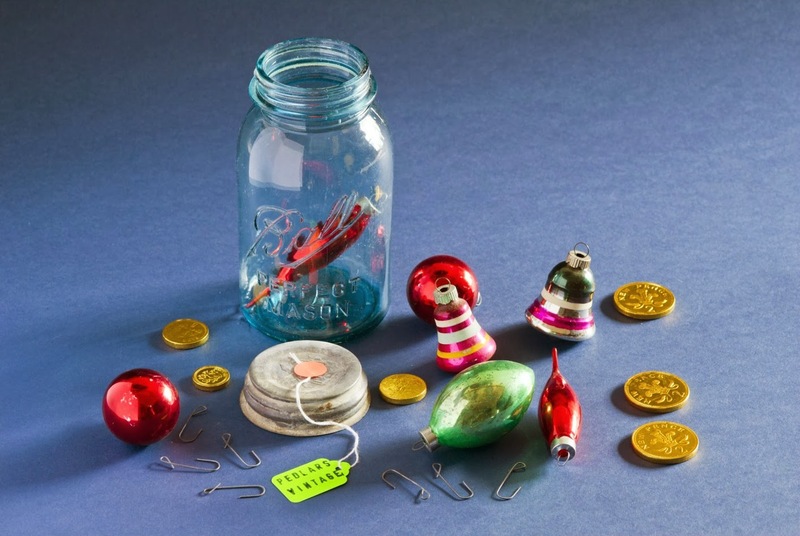 The vintage Christmas baubles come in original Mason jars (complete with certificate of authenticity). And it's not just vintage baubles we're giving away. 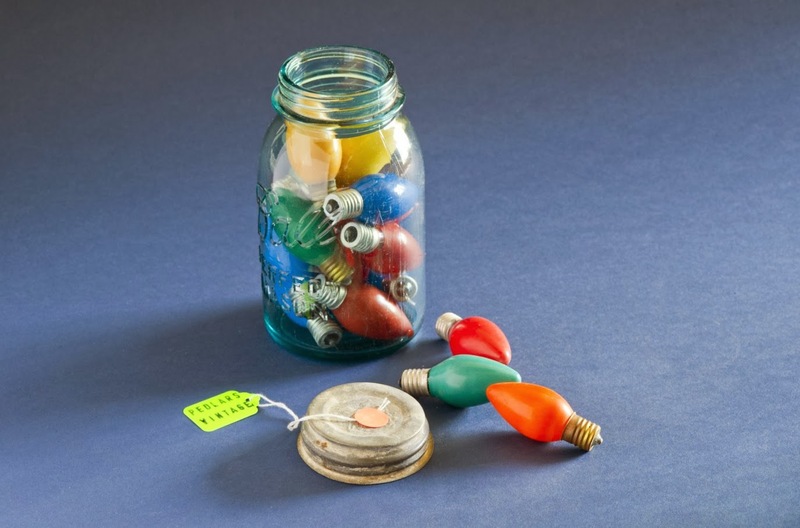 There's a Mason jar of vintage tree lights in the prize as well, with bulbs from the 50s and 60s. The contents and the jars are both pretty special so this time you've got lots of ways to win. Leave a comment below telling us about your favourite decorations. Did you have a loo roll angel on your tree as a kid? Do you have one bauble that you love? When do you put your lights up? Tell us about cats who trash Christmas trees! They're our favourite. Sign up to our newsletter (in the box to the right of your screen). It lands in your inbox on Friday afternoons to distract you from work and you get a £60 wine voucher whether you win or not. Pin one of these gorgeous images on Pinterest (making sure your pin links back to this page so we can count your entry). You can do as many or as few of these as you like, but there's absolutely no need to tell us where you've entered. We can see where you've entered. It ruins our counting and the email notifications will slowly drive us mad. Oh yawn, small print (read it). The competition will close at 11am (UK time) 6 December 2013. You must be UK based to enter, sorry you lovely overseas readers. If you're anon, your comment entry won't count and if you enter with lots of comments or a barrage of Facebook comments and tweets, we'll discount all of your entries and tell you off. The winning entry will be chosen at random and you must claim your prize within 48 hours otherwise we'll pass it on to someone else. We're not allowed to enter our own competitions but Siany buys a new expensive bauble each year. This time from the Liberty Christmas shop. By the time she's 70, her tree is going to be amazing. My Gran had loads of great ornaments - she had these lovely delicate Chinese lanterns that became more fragile year on year but so pretty. My favourites were the chocolates, I'm afraid. But I have some gorgeous little glass birds that I love. And I love the smell of tinsel! My current favourites are my lime green glittered pair of handsome stags! They are wonderfully kitsch! We always have decorations that mean something. My mum got us a little Santa choir as they are based on an angel choir that my brother and I always used to fight to put on the tree. My favorite decorations were the really tacky foil ones from the 80's, our living room as kids looked horrific looking back but as a kid we really loved it. I wish I could buy them again and have a kitsch revival. I love owls, and over the years I have slowly collected quite a collection of owl baubles. My other favourites are Nutcrackers, as I have always loved ETA Hoffman's story. My favourite decorations were some snow white and the seven dwarves ones. They were silver and glittery and pretty and now I'm wondering if my parents still have them and if I can 'borrow' them for our tree! My favourite decoration isn't for the tree, we have a square tile (like a kitchen tile) and it has a paper Father Christmas image on it using those foam spacers for a 3D effect, I have no idea where it came from and it’s still with mum and dad but every year even if we don’t get to visit (when I was in Thailand for Christmas) they HAVE to send me a picture just so I know that it’s been put out on display, I’ve added it onto my list that I need to inherit and remind them every year. My favourite were the two fairies on the top of our tree as I'm a twin. I love home made decorations - I make one every year for the kids so we have quite a collection! I love traditional decorations and colour coordinated too! I am signed up to your newsletter! I have a few vintage baubles that belonged to my gran.. .the pretty concave kind! One of my aims in life is to have a Christmas tree that echoes my parents', which is the accumulation of three daughters' and 35+ years' worth of stuff - from things we made at school and can't remember what they are any more, to stuff they've picked up on various holidays (including the most gorgeous delicate glass nativity decoration from Prague and a kiwi with angel wings from New Zealand). So far I'm succeeding. Of my own decorations, I have lots of favourites, but I think the main one is my glass Tardis (bought after seeing it here on DS when you went Doctor Who-mad before the 50th anniversary special). I like the mixture of it being such a delicate thing with my shameless geekiness. Close second are the glittery dinosaurs I'm in the process of making, because 1) they look awesome and 2) it's quite satisfying to hang a decoration you've made yourself. Ginger spice is our Christmas tree fairy, complete with Union Jack dress, platform boots and homemade teeny tiny wand. My son wants her to be the new doctors companion in his tardis playset but he's not tall enough to reach her. She's amazing. When I was young and single I aspired to a simple classy Christmas tree, but now I am older and laden with children I am beginning to appreciate the overly dressed, pasta and paper adorned tree. My favourite decoration is still the star I bought 18 years ago which sits right up top. My favourite decoration is a terribly ugly plastic goat dressed as Santa Claus. He is grubby and tattered and his beard is now all a bit clumpy, but for some reason, the goat=Christmas to both me and my sister. My mum hates it, thinks it is ugly, and tries to hide it, and every year we find him and put him pride of place in the centre of the tree so he is there for Christmas morning. I would love to win the baubles, as I had some of my nanas that looked just like the bells in the top picture, but my cats climbed the tree and knocked it over, and they smashed. I was so sad, and these would help a lot! I've nicked Siany's idea and this year bought a posh bauble (also from Liberty!) It's a totally gaudy carousel reindeer complete with glittery bits. Love it. I always loved the super-shiny baubles and "icicles" when I was a kid. I'm looking forward to putting my Doctor Who decorations on the tree this year--I got a TARDIS, two daleks and K-9 for Christmas last year and they're beautiful! I've been collecting Christmas decorations since I moved in with my then-boyfriend, now husband, with the intention of picking up something new in every place I visit. My favourite is the banjo I got in Nashville: it has nothing to do with Christmas, but still makes me smile. Even more so than the Boston lobster with the Santa hat on. I barely traveled this year, so my newest bauble (which can go up from tonight, once the Autumn Statement is out of the way!) is a series of Scrabble tiles which spell out "humbug" from a Glasgow-based crafter. My all time favourite Christmas decoration was a home made angel with the face of Jarvis Cocker. Little JC was a fixture on all my trees for at least fifteen years. Then he vanished. No idea where. Slightly heartbroken actually. I have a string of multi-coloured icicle lights that I used to put up around my bookshelf in my bedroom when I was little. I still have them but I was devastated to find that they finally died last year. I can't bring myself to throw then out though! I always love the orange and clove decorations we make yearly. Otherwise my favourites which come out year on year are those made by the kids when they were really little, they are very tacky but have such sentimental value! We used to have some particularly jazzy woolworths streamers but mum won't let me put them up any more because dad's decorated the lounge and he doesn't want pin marks. Also, they're from the 80's! I don't see anything wrong with that though. I have a few vintage baubles from my grandma which I love. My favourite christmas tree decorations used to belong to my grandmother, She used them on her christmas tree when I was a child, so they remind me of family Christmases and burnt brussel sprouts. My brother once replaced the head of the Christmas angel with that of a toy squirrel. None of us noticed till Christmas lunch when it loomed over us, quietly menacing. Perhaps not my favourite Christmas decoration but one of the most memorable!! My favourite decorations are the ones that either I, my friends or family have made, they are just more individual and personal. We are trying to balance our tree so the decs aren't 90% made in China, we've nothing against China but this year we have a bauble from Poland and one from Egypt too. I also want chocolate decorations this year like I had as a kid... We didn't have a cat but our dog once crept into the dining room and style all the chocolates from the tree... Another year she jumped up to v the kitchen side and destroyed my chocolate advent calendar...Fortunately she didn't get ill on either occasion! My mum always kept things that my brother and I made at school. They were lots of toilet roll/crepe paper crackers in my day! Now, I do the same thing. Last year my daughter made a cardboard Father Christmas with cotton wool as his beard, which I brought out again yesterday when we put our decs up! We have some very old decorations from our childhood, some of which were made by hand, which we still love. They're a little tatty now but beloved! When I was a child we use to put chocolate coins on our Christmas Tree. One year we heard a crash and our greedy Labrador had made a grab for one and pulled the tree down! My favourites were a strange pink pig, with a fluffy scarf and a sparky dress. I have no idea were it came from but I loved it, probably because it was so unusual. I also liked the two penguins my mum made - they were so cute. I love the marzipan decorations but they don't last long! I always used to love the tinsel but I really don't like it now. I think my favourites are some handmade fabric stars a friend made me a few years ago. was almost ruined by my pet. adorable with a big licky tongue! when as quick as a flash went the 'lekky! Yes the fuses had blown, there was smoke! we could not work out what had broke! the dog had pee'd up our new Christmas tree! He thought that the tree wasn't pretend! the poor pup, he'd not seen such a sight! I grabbed Blacks and we hid under my bed! mum laughing as hard as could be! and d'you know, he went and did it again!!! My current favourites are my lime green glittered pair of handsome stags! I collect christmas decorations from Newbridge Silver (based in Kildare in Ireland) and every year I either buy one or am given one (cost about £10). I have 15 to date and they are fabulous. Something to pass on to the family in future years.